Remotely-sensed observations and model output of sea surface temperature, wave height and period, and oceanic productivity will be used to develop time series data sets and to quantify long-term mean oceanographic conditions for each island. These data will be ground-truthed with a subset of data derived from in situ temperature loggers. The methodological approach for generating these island-specific oceanographic profiles was developed by colleagues within NOAA Pacific Islands Fisheries Science Center in collaboration with members of our research team, and is a novel and powerful application of remotely-sensed data for nearshore applications. 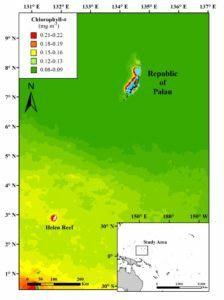 These data will serve as the foundation for characterizing the environmental characteristics of each island, allowing us to interpret biological patterns on the reef in context of the environment in which the organisms live. To the right is an example of a productivity map of the Palauan archipelago (mean chlorophyll-a values from 2005-2015). These maps contain satellite-derived observations of chlorophyll-a to quantify long-term means within a designated region, following methods developed by Gove, et al (2016). Chlorophyll-a concentration values were accessed online from the Moderate Resolution Imaging Spectroradiometer (MODIS) data for ten year period (2005-2015). Using ArcGIS 10.3, ten year means were displayed and interpolated across the region. Values were standardized to mean chlorophyll-a values derived from the Central Pacific.